A free deluxe breakfast complimentary Wi-Fi seasonal outdoor pool and easy area access draw our guests to the Comfort Inn Clemson University Area. This four-story Comfort Inn has 122 rooms some of which are designated non-smoking. Pets are allowed for a fee. All rooms include free Wi-Fi irons ironing boards hairdryers and premium cable TV. Guests enjoy a complimentary deluxe continental breakfast each morning. The hotel also has a seasonal outdoor pool and on-site laundry facilities. Parking is free including ample space for larger vehicles. 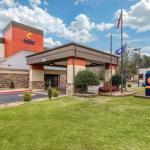 The Comfort Inn is one mile from Clemson University Brooks Center for the Performing Arts and the South Carolina State Botanical Gardens. Woodburn and Ashtabula plantations are nine miles away. Greenville-Spartanburg Airport is 45 miles from the hotel.